Speaking at Shipping 2018, the Connecticut Maritime Association’s (CMA) annual conference, Knut Ørbeck-Nilssen, CEO of DNV GL – Maritime and IACS Chairman, looked at some of the initiatives taken at the International Association of Classification Societies (IACS) that were changing the organization. 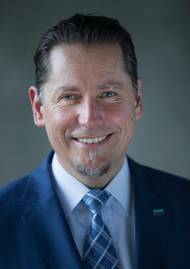 “It is my duty and honor to encourage the world’s biggest classification societies to pull together to adapt to this rapid pace of change and create a strong foundation for IACS as the leading maritime technical association,” Ørbeck-Nilssen said. The classification society DNV GL presented GTT, together with its partner TECHNOLOG, a General Approval for Ship Application (GASA) statement for the retrofit of very large container vessels (VLCVs) with exoskeleton membrane LNG tanks. LNG membrane tanks will generally offer more efficient space utilisation for cargo storage and as fuel tanks. The exoskeleton concept offered by GTT, and developed in partnership with TECHNOLOG, consists of a structure that can be prebuilt on the dock and then installed as a complete unit in the hull of the vessel. 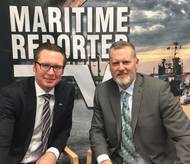 On December 13, 2016, Knut Ørbeck-Nilssen, CEO Maritime, DNV GL, conducted an interview with Maritime Reporter TV's Greg Trauthwein at DNV GL's Washington, DC office. Ørbeck-Nilssen provided candid commentary on the pace and direction of the offshore and maritime market recoveries, providing unique insights on everything from the evolution of "Big Data" to challenges posed by regulation, specifically the recently ratified Ballast Water Management Technology rules and the new mandate to cut sulfur in marine fuels from 3.0% to 0.5% by 2020. The Tsakos Group of Companies has selected DNV GL to assist in preparing a cybersecurity management system for its fleet and onshore facilities – the first such management system developed by a shipping company in cooperation with DNV GL’s Advisory Services. The Greek shipping organization will implement a comprehensive system of safeguards and procedures to protect their assets from cyber risks. DNV GL is the first classification society to put this kind of cybersecurity service into practice. Autonomous ships, smart on-board systems: At the Maritime Future Summit on September 5, industry leaders will discuss the future of shipping. For the first time SMM hosts a conference dedicated to digital shipping. Cyber Ships: What may sound like a word from a science fiction novel to some is a hot topic in the maritime business world today. Low-crew and no-crew concepts are buzzwords in the shipping sector, and some initial trials with unmanned ships are already being undertaken. “Visionary ideas drive the evolution of humanity, and the maritime industry is no exception. Launched at the Hyundai Mipo dockyard in Ulsan, South Korea, the newly built Lindanger is the world’s first methanol fueled ocean-going vessel. The ship is the first of two dual-fueled 50,000 dwt tankers owned by Norwegian firm Westfal-Larsen that will be chartered to global marine transportation company Waterfront Shipping. With a MAN designed Hyundai–B&W 6G50ME-9.3 ME-LGI dual-fuel, two-stroke engine on board, the Lindanger can run on methanol, fuel oil, marine diesel oil or gasoil. DNV GL’s Maritime CEO Knut Ørbeck-Nilssen recently met with Konstantin Palnikov, Director General of the Russian Maritime Register of Shipping (RS), at the RS head office in St. During the talks, DNV GL and RS expressed satisfaction at the positive experience of cooperation in dual classification of ships. As of today, about 20 ships are in dual RS–DNV GL class. The two companies discussed prospective areas of further cooperation that would enable them to effectively complement each other’s unique competencies. DNV GL's new rules for classification of ships become publicly available online today following a development and review process involving 250 internal experts and more than 800 customers and maritime stakeholders. The result of the combined experience and expertise of two classification societies, the new rules are modern, easy to work with, industry-driven, efficient and ready for the future, DNV GL said. “This is an historic moment,” said Remi Eriksen, DNV GL Group President and CEO. “After such a thorough process it is very exciting to launch the new DNV GL classification rules. More than 800 customers and stakeholders will receive the new DNV GL rules today as part of an external hearing process before their publication and entry into force. According to DNV GL, the rules are the signature of the classification society, forming the basis of the organization and playing an essential role in its work to make the maritime industry safer, smarter and greener. The merger of DNV and GL brought together a set of competencies, cultures and histories that stretch back 150 years – embodied in the rule sets of the two organizations. 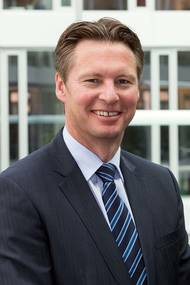 Knut Ørbeck-Nilssen is appointed president in DNV GL Maritime. Ørbeck-Nilssen will take on the role as president from 1 January 2014. He will be member of the Executive Committee and operate out of Hamburg. 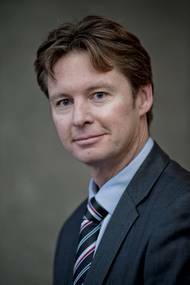 Tor E. Svensen, CEO DNV GL Maritime, says “I am really pleased to have Knut Ørbeck-Nilssen on board in this role. He has more than 20 years of experience from a variety of disciplines. “I am confident that the Maritime leadership team will ensure that we deliver high quality services to our customers and through this secure and strengthen our position in the market,” says Henrik O.